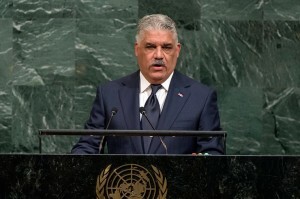 Addressing the General Assembly’s annual general debate in the wake of the massive destruction caused in the region by Hurricane Irma and as Puerto Rico was being battered by Hurricane Maria, Miguel Vargas Maldonado expressed solidarity with all countries that had suffered these back-to-back extreme weather events and said that the deaths and material losses have been immense. He said one thing was clear, that the damage caused during this hurricane season alone far exceeded the Dominican Republic’s gross domestic product(GDP). Moreover, the “lethal power” of these recent storms – which had been intensified by climate change – had eroded more than roads and beaches, it had shattered lives and destroyed dreams. Indeed, this reality has led him to raise once again to the General Assembly, the imperative need to join forces to confront these threats. “It compels us to act in a responsible, cohesive way for the sake of our people’s lives,” he said, stressing that it is not enough to send messages of solidarity or humanitarian aid after natural catastrophes have caused death and devastation. “And it is absolutely not enough to sign agreements on climate change; It is critical for these agreements to be coherent, move forward a joint agenda, and develop concrete action plans,” said the Foreign Minister proposing the creation of a special fund to deal with natural catastrophes, to foster awareness, prevention, and resilience strategies, which will allow us to preserve life. “We must act on this or otherwise the future will judge us for our total lack of responsibility,” he warned.